Melissa Chimera is a conservationist and Honolulu native of Lebanese and Filipino ancestry. She studied natural resources management and painting at the University of Hawai‘i, a world epicenter for plant and animal extinction. Her paintings contemplate the tipping point of endangerment, where heaven and hell sometimes coexist. Her recent mixed-media work creates a layered and complex iconography of sculptural compounds, oil and stitching on linen, prompting questions about extinction, globalization, and our role as humans in these processes. She juxtaposes the catastrophic implications of environmental change, war, and alienation with a method firmly grounded in formal elements of painting and treatment of canvas as textile. Chimera keeps a studio in Maui and exhibits in Hawai‘i and across the United States, Asia, and the Middle East. 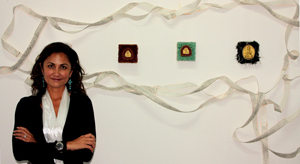 In 2009, she was commissioned with her mother, Adele Ne Jame, to create Inheritance: Reclaiming Land and Spirit, a joint poetry-painting project for the Sharjah Biennial. 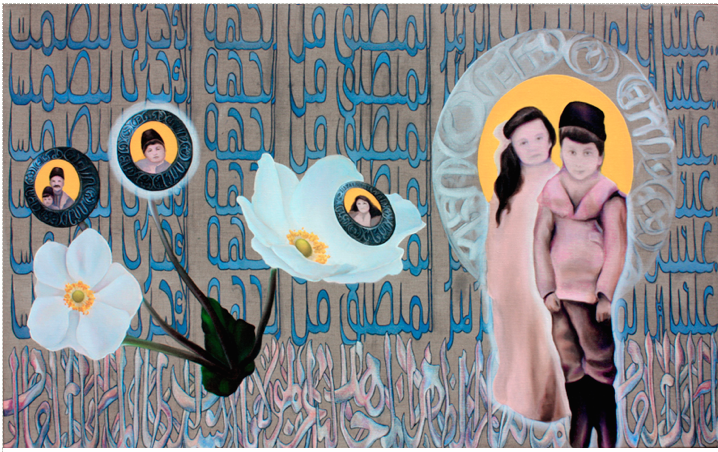 This portrait is a tribute to my mother’s father, Nash Ne Jame, and his family of Lebanon. All of them, save my grandfather (second from the left), perished. We know they left Beirut and the mountain town of Maasser for a better life and died on the road to Damascus more than a century ago. They abandoned their war-torn mountain village searching for food and sanctuary in a country strangled by the Ottoman Turks, their grip upon a vanishing empire ever more desperate. Were my great-grandparents among the many who walked from their village for days, collecting rotting lemons to eat? From America, Nash searched for his family across the Middle East. His sister Melvina escaped enslavement by kidnappers by dressing as a boy. With the help of the Red Cross, his siblings landed in New York, each with a tattered suitcase. Later in life, Nash grew distant, never speaking of the tragedy that befell his family. He lived an adventurous life as an aerial photographer, eventually settling down with my grandmother and raising two children. A highly accomplished yet quiet man, he died when my mother was fifteen years old. I never knew him.